Emirates and Turkish Airlines have said the cabin ban on laptops no longer applies on their flights to the US. In March, the US banned laptops and other large electronic devices to and from eight mostly Muslim nations, fearing bombs may be concealed in them. 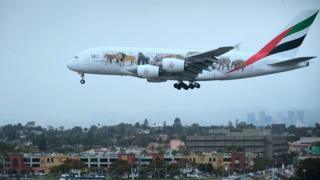 Emirates, which flies to the US from its Dubai hub, said it worked with US authorities to meet new security rules. Turkish Airlines said it was also now allowing passengers travelling to the US to take their laptops onboard. The two airlines are now in the same position as Etihad, which saw the ban lifted on Sunday for its flights from Abu Dhabi. Dubai, Istanbul and Abu Dhabi airports are reported to have put tighter security checks in place. Will a laptop ban make flying more dangerous? Emirates said in a statement: "Effective immediately, the electronics ban has been lifted for Emirates' flights from Dubai International Airport to the USA." The airline, which flies to 12 US cities from Dubai, thanked customers for "their understanding and patience during the last few months". Turkish Airlines said on Twitter that all electronic devices would be allowed on its US flights from Wednesday. It leaves Qatar, Morocco, Jordan, Egypt, Saudi Arabia and Kuwait waiting to have the ban lifted. Saudia, the flagship carrier for Saudi Arabia, said passengers would be able to take the electronics on US flights from 19 July. It remains unclear whether US-bound passengers going through Dubai and Istanbul airports will now need to factor in more time for security checks. The airlines aren't saying much about specific changes they have made. But Norman Shanks, an aviation security expert, said US officials will have been testing not only equipment but also procedures, in particular how stringent the checks are and how the staff carry them out. So increased vigilance can be expected. The new US security requirements extend to 105 countries, not just those subject to the laptop ban. A UK airports insider says that compliance with the new rules should be less difficult in Britain than elsewhere, given security requirements are already some of the world's most stringent. Airlines had expressed hope that new US guidelines announced last week would pave the way for the lifting of the electronics ban. The measures include enhanced screening, more thorough vetting of passengers and the wider use of bomb-sniffer dogs in 105 countries. According to reports in Turkish media, US and UK officials visited Turkey's main international airport in Istanbul on Tuesday. Turkey has recently started using sophisticated tomography imaging devices for X-ray and ultrasound screening at Istanbul's Ataturk International Airport. Under the March rules, devices "larger than a smartphone" were not allowed on US-bound flights from the eight Middle East countries. The UK imposed similar rules to the US, but did not include Dubai and Abu Dhabi. The boss of Turkish Airlines has suggested he expects the UK to lift the ban for his airline soon. The UK government banned devices larger than 16.0cm x 9.3cm x 1.5cm on direct inbound flights from Turkey, Lebanon, Jordan, Egypt, Tunisia and Saudi Arabia.